If you've found yourself yanking out your hair, wildly frustrated by the new two-disc Limited Edition release of Christopher Nolan's Memento, you're certainly not alone. Both discs, particularly disc 2, provide unique challenges for those of us who prefer straightforward DVD menus. In short, Nolan has made the most of the DVD format to create a fascinating--if somewhat maddening--incarnation of his masterpiece. To ease your exasperation, I've compiled this Navigating the Memento Limited Edition DVD. With this companion in hand, you should be able to easily click through the psychological-testing menus to access the special features that you want. When you first insert the first disc, you are--appropriately--confronted with a test of your memory. 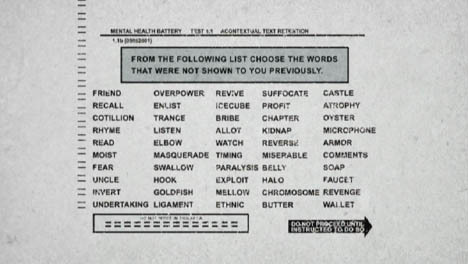 A series of words flashes by, and you are "required" to remember those words to navigate the main menu, which is a test of text retention. As music from the film plays, and as Leonard whispers "Where am I? ", a five-column list of words appears. To get deeper into the menu and even to start the film, you must choose the words that did not appear in the opening stream. After you look over the list for a few minutes, the correct choices become clear. In fact, the incorrect words fade into the background at certain intervals. To play the film, select Watch. To view a chapter menu, select Chapter. You'll find a series of multiple-choice questions, but the answers don't matter. The answer key to the right, where you click your chapter selections, has only one clickable answer per chapter. So, no guesswork here. Just click the chapter number you want. To choose audio options (Dolby Digital 5.1, DTS 5.1), select Listen, then choose Y for the format you prefer. To listen to Christopher Nolan's audio commentary, select Comments, then choose D. The commentary contains four subtly different endings, each of which randomly branches off at I:33:52 time mark. One of these versions slows downs and starts running backwards, unintelligibly. The other three versions offer only subtle differences. To choose subtitle options, select Read, then choose Y for questions 3 or 4. On this page, you'll see a coded question that needs to be deciphered. The decoded question is The question is whose lies to you believe; yours or ours? Interestingly, the t in question is missing. A hidden feature may lurk here, but I've not yet uncovered it. 1) Chronological Presentation: An illuminating re-edit of the film that allows for new appreciation for Memento's structure. 2) Anatomy of a Scene: A 25-minute full-frame documentary originally aired on the Sundance Channel. 3) Director's Script: Lets you view the entire annotated shooting script as the film plays. 4) Memento Mori: The original short story by Jonathan Nolan. 5) Theatrical Trailers: Contains the U.S. and international theatrical trailers. 10) Bootleg Cover Art Gallery: Just two pieces of bootleg cover art. 11) Journal: Pages from Leonard's journal. 12) Menu of Supplements: Lists only the advertised supplements (Trailers, Anatomy of a Scene, Director's Script, Production Stills and Sketches gallery, International Art Campaigns). To access the chronological re-edit, select the Clock, and choose C on the following five pages. You'll see a quiz that shows four illustrated panels of a woman changing a flat tire on her car. The quiz asks you to place the panels in chronological order. The trick, of course, is to place the panels in backwards order, which is 3, 4, 1, 2. After you do so, the film begins playing its scenes in chronological order. Playfully, this cut starts with the end credits rolling downwards. After that, the film's forward-moving black-and-white sequences begin, focusing mostly on the Sammy Jankis back story. (The chapters have simply been rearranged in chronological order.) This re-edit is presented in Dolby ProLogic. Although you can't fast-forward or skip forward through this presentation, you can jump to certain time codes. To access this featurette, select the Skull, and choose C on the following three pages. You use your angle button to switch from the film to the script. To access the Director's Script, select the Book, then choose C on the following two pages. You can use your angle button to switch on-the-fly between the script and the film. To access Jonathan Nolan's original short story, select the Clock, then choose C on the following five pages. You're back at the quiz that shows four illustrated panels of a woman changing a flat tire on her car. This time, place the panels in chronological order, which is 2, 1, 4, 3. To view the U.S. and international theatrical trailers, select the Binoculars, then choose C on the following five pages. To access this gallery, select the Binoculars, then choose C on the next page. Choose D on the second page. To access this gallery, select the Globe, then choose C on the following four pages. To access this gallery, select the Binoculars, then choose C on the following four pages. Choose B on the fifth page, and choose A on the sixth page. To access this gallery, select the Skull, then choose C on the following two pages. Choose E on the third page, and choose D on the fourth screen. To access Leonard's journal, select the Compass, then choose C on the following three pages. Then, choose B on the fourth page. Choose C on the following two pages. To access the special features menu, select the Clock, then choose C on the following two pages. Select E on the third page. To access the DVD credits, select the Clock, then choose C on the following four pages. Choose D on the fifth page. By now you're familiar with the flipping-pages style of this psychological-testing themed menu. 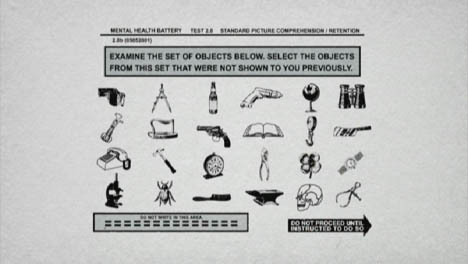 Essentially, from the menu you can access six testing sections through the Compass, the Clock, the Book, the Globe, the Skull, and the Binoculars. The general menu behavior once you've selected one of those six icons is to flip pages up as you answer questions. However, you can also--in specific places--flip left and right from one section to another. In each stack, you'll find a page from which you can navigate left or right. You'll recognize this page because you can glimpse pages on either side of the centered page as it flips toward you. If you choose A on this special page, you move to the left; if you choose E, you move to the right. 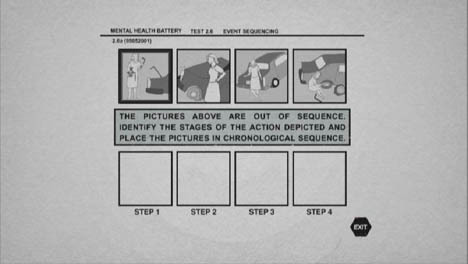 Question about woman changing tire: Choose 3, 4, 1, 2 to access the Chronological Presentation, and choose 2, 1, 4, 3 to access the Memento Mori short story. Question about identical twins Jim and John: Choose C to access the Director's Script. Question about missing parts of images: Choose C to access the Anatomy of a Scene featurette. Question about the light bulbs and switches: Choose C to access the Theatrical Trailers. Question about the differences between images of the woman: Choose C to access the International Art Campaign. Question about the woman and "Escape" printed on a mirror: Choose C to access the Production Stills and Sketches.